Sitting in the midst of the Kingdom’s corporate giants and banks is Raintree, one of Cambodia’s most creative workspaces yet. Boasting 3,000 square meters of office space, a loft event space and an outdoor terrace, Raintree is a boutique office developed for diverse businesses in more advanced stages. With local ventures Brown, Poise Mera and Village Roast Duck housed in the new swanky establishment, Raintree is home for local entrepreneurs. We speak to Zoë Ng, co-founder of Raintree, to learn more. This interview has been edited for length, flow and clarity. Can you tell us more about yourself and your involvement in the Raintree project? I’m one of the co-founders of Raintree, my other partner is Hok Kang, who is an architect, and is one of the co-founders of Brown. He also runs his own architecture practice called HKA and his own development company called Urbanland. For me, I moved from London, the UK, two years ago, but have been in Cambodia on and off since 2005, and I eventually came back here. Hok and I have known each other for over 10 years, we’ve been talking about doing a project together, and this is our first one. In a previous life I was a management consultant with McKinsey & Company, and then I spent some time at Google, out of the London office. Through both these jobs, I managed to travel a lot, which is great. 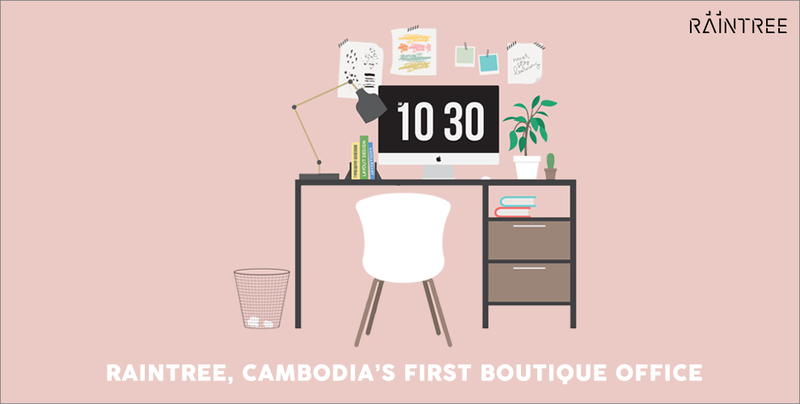 I went to my first startup in London, which was actually a new brand in beauty/cosmetics, after I wanted to move to Cambodia. The first time I came to Cambodia was for education in a nonprofit organisation, and I jokingly said to my friend, “Give me 10 years and I’ll come back.” Eight years later, he was like “Why don’t you quit your job?” So I did. While I had no mortgage, no pets and no kids! What inspired the creation of this workspace? When I moved back to Cambodia, I realised I was always passionate about young people, education, and also design. For me as a startup, I actually struggled to find great office space. The other thing that I observed was that there are loads of really great entrepreneurs; it’s a really entrepreneurial culture here. There are some great coworking spaces here too, but I think when your company moves to a slightly later stage, when you start to approach becoming an SME or you’re a little bit more established, it’s not so easy to find an office space that works for you. What is the workplace culture like behind the Raintree project? I am super lucky, having come from two phenomenal working cultures. Three phenomenal working cultures actually, the first one being super open, but still super professional. At McKinsey, we really value feedback and we try to kind of destroy corporate hierarchy, so everyone’s voice, no matter how junior or senior, is represented in all the work that we do. I think that has been transported to Raintree. Google is infamous for having a fun and very dynamic work culture; I think we also try to represent that a little bit here too. So we are a very youthful organisation. I truly believe that people being happy at work makes them a thousand times more productive. Also, when it comes down to people, everyone has interests outside of work. Recognising that everyone has a job, but also has interests and other things they like to do – we try to embrace that a little bit here too. For example, one of our team members is super entrepreneurial. She has aspirations to start her own business, so we will support her in whatever way we can. How will a space like Raintree impact Phnom Penh’s businesses? We hope to provide a different type of workspace for organisations. Firstly, coming from professional services, being in the CBD and having this space, we are trying to really demonstrate what a professional community can bring or how it can support the growth of various organisations. For example, how being co-located next to businesses in different industries, but with the same kind of work ethic and work values, can really grow everyone’s respective business networks and client bases. I hope that aside from supporting creative and SMEs in their next stage of growth, we can demonstrate how a professional community can accelerate businesses across the board. What types of businesses can benefit from Raintree’s resources? We hope that everyone can benefit, but there are a couple of obvious things. I think that creative, media or tech industries that are looking for a highly professional but different feel of workspace can benefit from the project. The other aspect is through our event space upstairs, which can host 150 to 200 people. What we hope to provide is an alternative to traditional hotels for various forms of professional activity, whether that means training, workshops, product activations, parties, or board meetings, we just want to provide a more flexible space, which you can turn into something that makes sense. For example, for my old FMCG clients like Unilever and P&G, where could they go to activate brands, or do product launches? I think it’s still a challenge in Phnom Penh. We hope that we can at least provide one option for different industries. How many businesses can actually be in the building? In terms of permanent office space, I would say something in the range of 40 to 50, but that would massively depend on the size of tenants. We hope that we can also house a few entrepreneurs regionally, those that are travelling through as well. Apart from being an office space, what are the other activities Raintree will also offer? We have complementary retail outlets on the ground floor, and we try and support them with community activities. Brown Raintree already hosts a number of activities; they’ve done things like brewing shows for their launch and will continue to do those types of activities. They’re currently housing a temporary installation in their café as well, by Cambodian artist Pich Soheap. Our minimart-pharmacy tenant also does a lot of work with the Ministry of Health, so there are a variety of programmes from our retail tenants. The other more fun things we will do, is that we hope to introduce health and wellness upstairs in the loft event space, so that means pre and post work yoga, Zumba, and also trying to support more cultural and arts activities through our alternative exhibition space. We’re also a big supporter of entrepreneurship, so we plan to have workshops, and meet and greets through our regional network as well. We’ll transport as much as we can, and we’ll try and add more programming to the mix. Another component is more professional development, which we will also open publicly. We have partnerships with a couple of universities and professional training associations that will look to do training up there. Our last thing focus is employability and young people, which is kind of my background. I think there are so many great young people out there, and people always complain about the lack of talent or human capacity here. But I actually think that one of the bigger gaps is matchmaking, and having young people understand their career paths and what their options are when they graduate. Because there’s so much demand for talent, what I often see is a lot of my ex-students end up in great jobs from a salary perspective, but they don’t think about the three, four, five year horizon and what they’re really passionate about, so we will also welcome any kind of program that supports that upstairs. Will all these activities be open to members of the public? Yes! This is us trying to connect with a broader community, physically in this kind of prime commercial location. What are your future plans for Raintree? The most important thing is filling the building, so step one, fill the building. We will do a lot of outreach programs and we will be inviting the community to visit us. The second thing is building our programming and events. We’ve had lots, and lots, of requests for the event space, but we’re finding our long term partners and organisations who really like to use the space. For our future vision, once we’re a little bit more stable, we want to give back to the community, whether that means via entrepreneurship or education programs, we will do as much as we can. So it’s still a work in progress. We’re just really excited for people to come see us; we’re really excited for people to start using this space.